The latter portion of this year, I've really started to gravitate less for all of the colorful floral and prints I've always never been able to resist buying, to more of a staples and neutrals, which I have really started to thank myself for because well duh, they go with everything and I wear them all the time. This Choies dress is pretty much one of those. 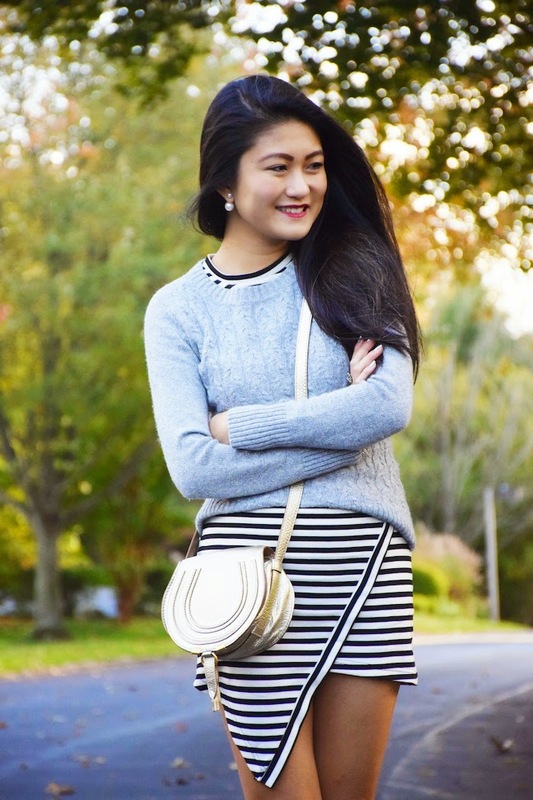 It has such a classic black and white striped look, but that asymmetrical bottom really sold me. It's unique and edgy but still classic. I've been such a repeat offender with this, and have absolutely no shame about it. Since it's a dress, it's even better. I get to wear a sweater over it (like how I did here), and turn it into more of a 'skirt', and I've also worn it with different jackets/cardigans and vests. Hooray to versatility, and Choies for helping me discover my new favorite go-to dress. The hem of this dress looks awesome! I have that dress! I love how you made it fall appropriate! I have to try it! On another note, I've been wanting to order from Choies but was unsure -- how did you like the shipping/quality? Perfect layering here girl!! I absolutely love the asymmetrical hem of the skirt.You look lovely!